This post is sponsored by PAM but the opinion expressed in this post is my own and based on my recent experience! 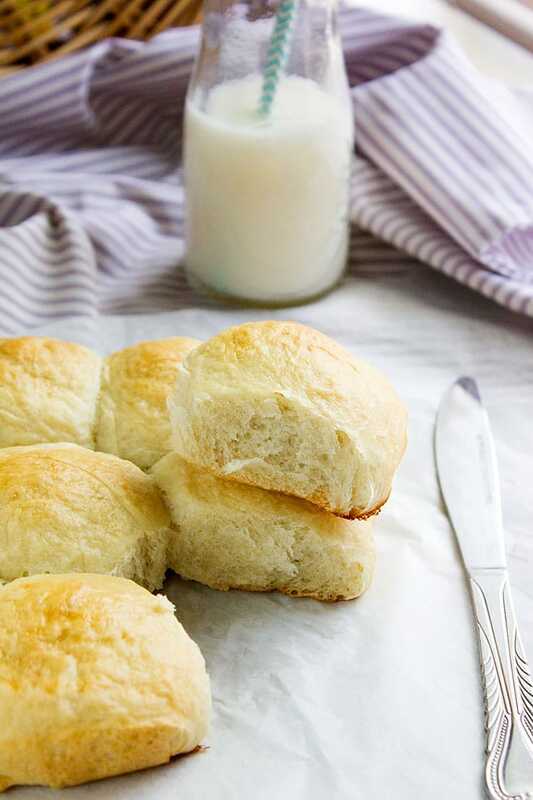 Soft Sweet Rolls – My family must have dessert almost every day and I like to keep it as light as possible. Today was a little confusing since I craved apple pie but a scoop of ice cream would surely find its place on it. So, what should I do? 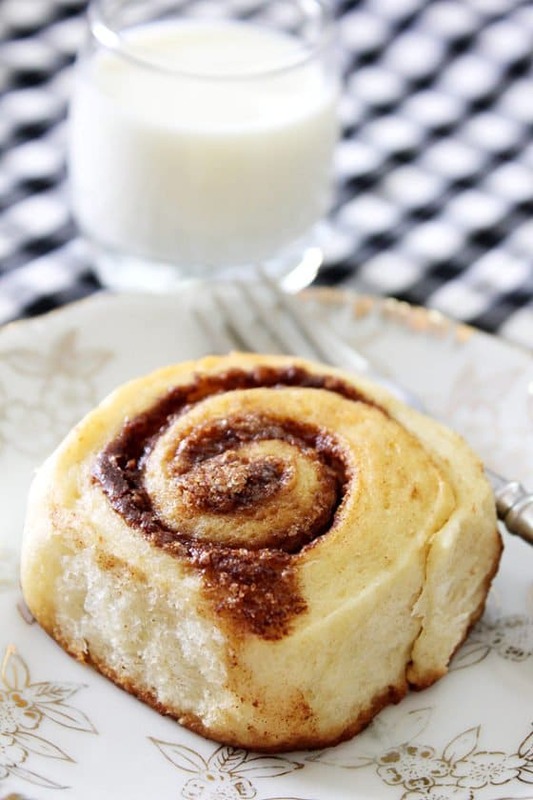 I thought of making Soft Sweet Rolls stuffed with Apple Pie Filling. Making the rolls eliminated the unnecessary scoop of ice cream, and to make this treat even lighter I used PAM Spray Pumps sent to me by PAM. This is a non-aerosol cooking pump which did not add extra calories and prevented the rolls from sticking to the pan. 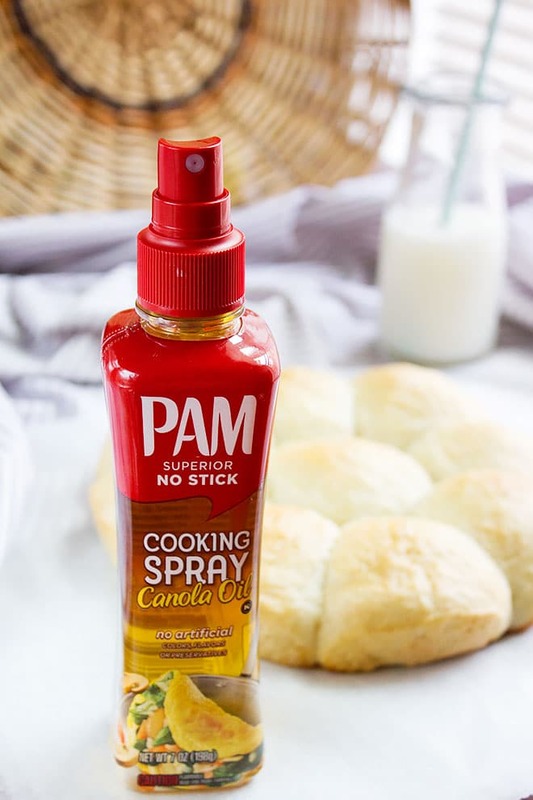 I held PAM Spray Pumps around 10 inches away from the baking pan and sprayed one time. It was enough to cover the whole 8” pan but I went ahead and sprayed a second time because it’s only 4 calories! I then went ahead and formed 9 equal sized balls from the dough I’ve prepared earlier. I filled each ball with apple pie filling (I’m providing the recipe for it below). I placed the balls in the baking pan and left it to rise again for 30 minutes. The balls doubled in size and took a beautiful shape, this indicated that PAM spray prevented it from sticking to the sides of the baking pan, allowing it to rise freely. I was happy with that and was looking forward to seeing the after-baking result. While in the oven, the soft sweet rolls rose again and separated a little from the edges of the baking pan. My rolls have baked evenly and looked great, almost perfect. One last check was left though; taking it out of the pan. 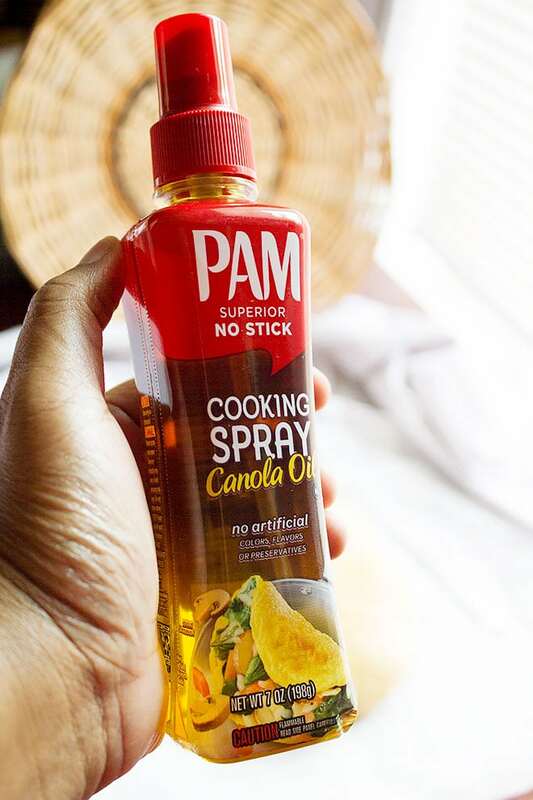 I didn’t have to worry, because thanks to PAM, it came out easily and the bottom was golden brown. 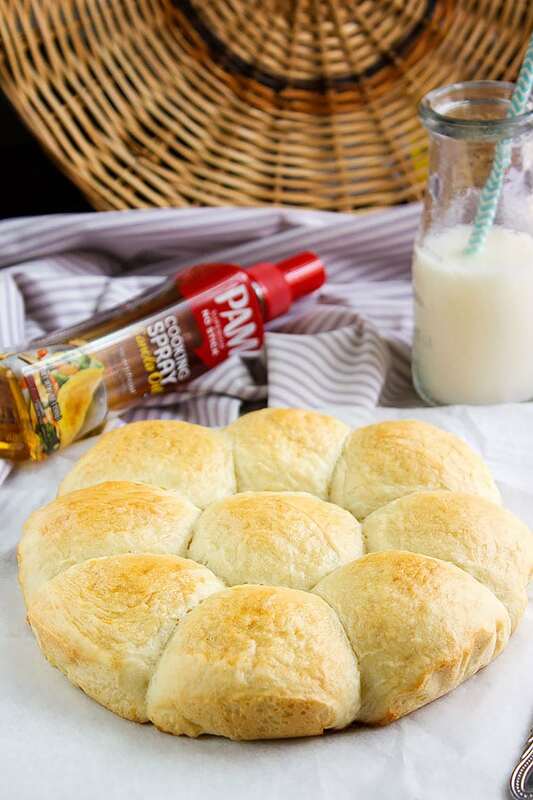 Baking Soft Sweet Rolls Made Easy. 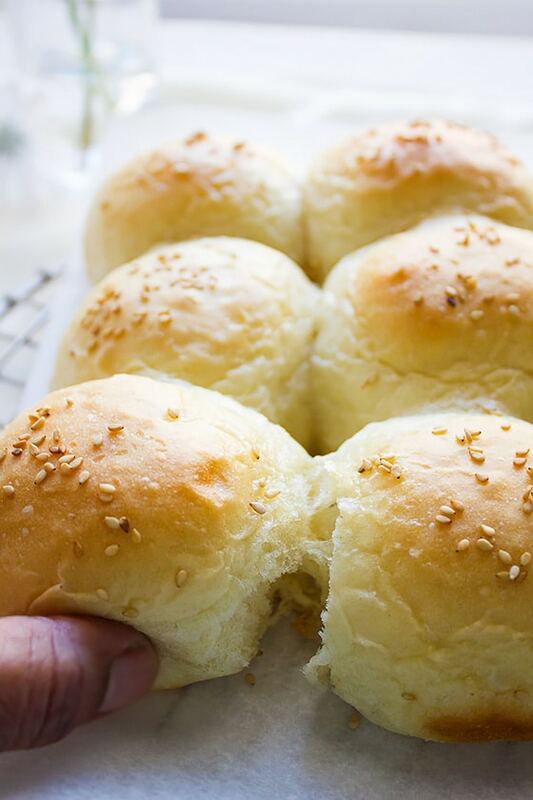 As you can see, the soft rolls are pretty and if you taste one you’ll discover that one roll will never be enough. I’m a happy baker; I saved calories, time, parchment paper, aluminum foil, extra flour, and baked a fluffy, light, and delicious treat for my family without struggling to take it out of the pan, You PAM Do It! 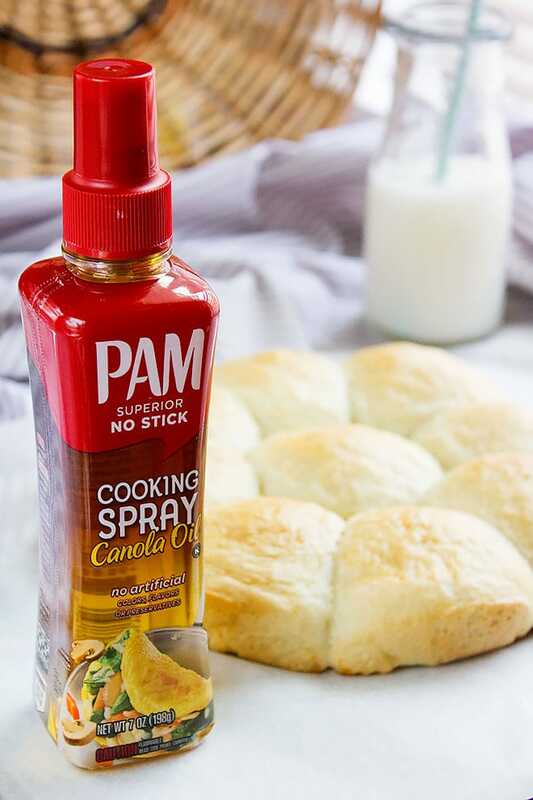 The taste of the oil from PAM spray wasn’t present in these rolls. PAM Spray Pump did its job transparently and efficiently. There are no artificial colors, flavors or preservatives. I’m glad to have discovered a new trust worthy product. 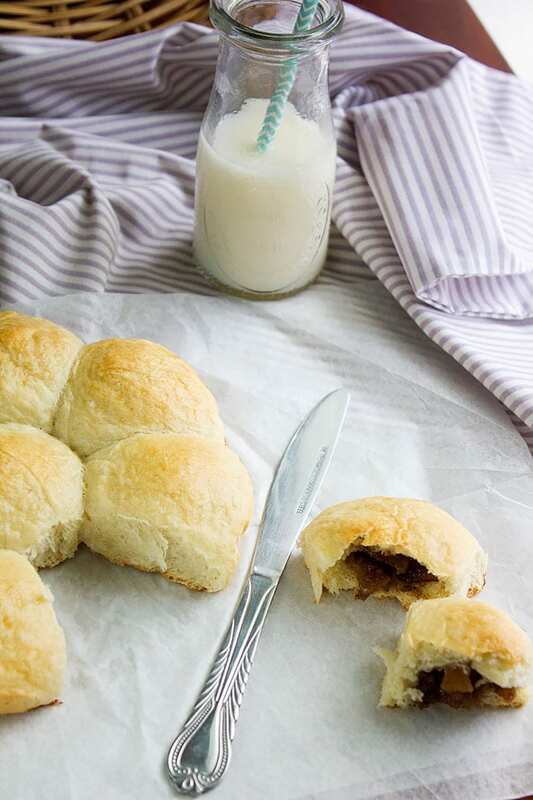 These rolls are sweet and soft and are filled with apple pie filling. Perfect as a snack or dessert. 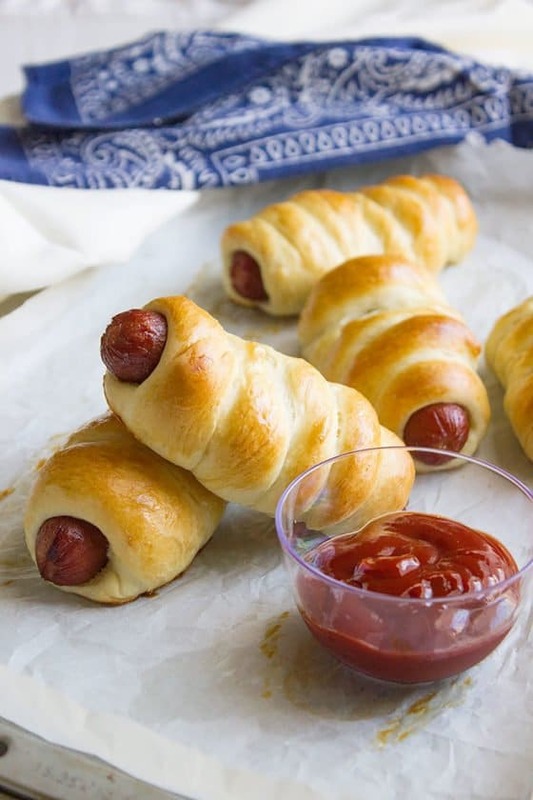 These rolls keep well so pack some and take it with you to work! Mix sugar and yeast with coconut milk. Keep aside. In a bowl, add the flour, salt, and the yeast coconut mixture. Knead until you form a dough. 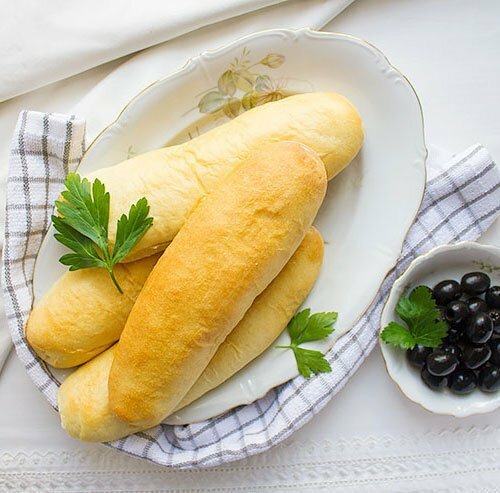 Place the dough on working surface and knead for 5 to 7 minutes. 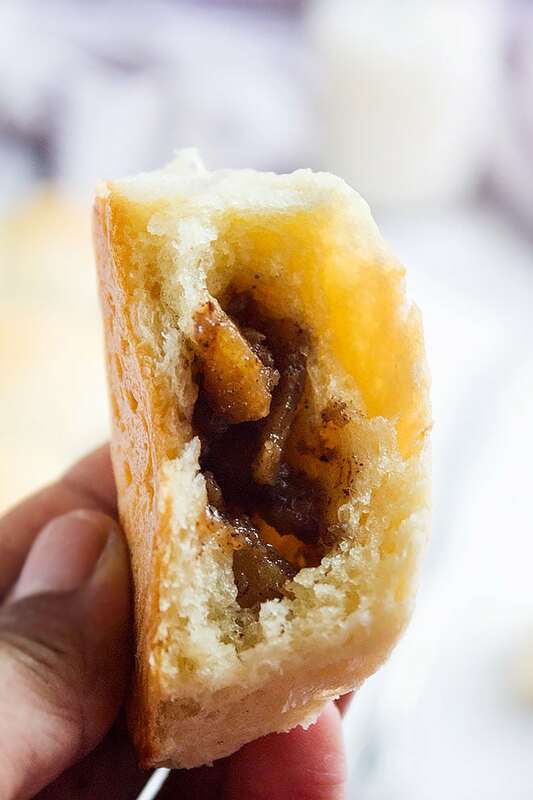 The dough will be soft but will no longer stick to your hand. Cover and place in a warm place to double in size. This may take one hour and a half. In a sauce pan, add all the ingredients for the filling except the cornstarch and stir until the apple is soft. Add the cornstarch and stir on medium heat for two minutes. Keep aside to cool. Form 9 equal sized balls from the dough. Divide the filling into 9 equal portions. Flatten the balls with your hands and place one portion of filling in the middle. Close and form a sealed ball again. Do this with the rest of dough balls and filling. Spray an 8” pan with PAM Spray Pumps. Place the balls in the baking pan and leave it in a warm place for 30 minutes to allow the balls to rise. Preheat oven to 375F/190C. Bake for 20 minutes on the middle shelf. This is a sponsored post written by me and on behalf of PAM Spray Pumps.